EKT highlights the real challenges for businesses internationally active. 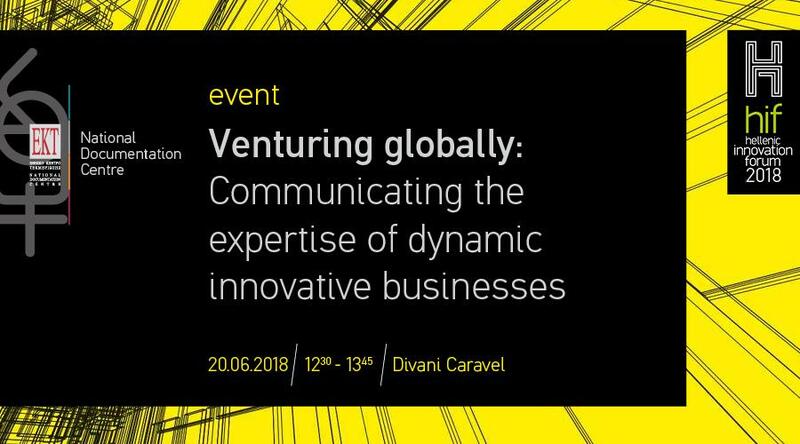 The National Documentation Centre (EKT) is organising an event on “Venturing globally-Transferring the expertise of dynamic innovative businesses” within the Hellenic Innovation Forum (19-20 June 2018, at the Divani Caravel Hotel, Athens). The event will take place on Wednesday 20 June (12.30-13.45) in the 'Vergina' Meeting Room. What are the challenges a business with international activities faces? What is required for business growth outside Greece? What are the requirements for building an effective “network” and how international networking is actually achieved? What do a Greek company based in Holland, a Dutch entrepreneur and two Greeks who work in a global context (in Greece and abroad) have in common? How ‘connected’ are they? What financial needs and what opportunities are there? How crucial could the role of European funding be for a Greek biotechnological business, a robotic systems business and an environmental technologies business? What does a business expect from an institution such as the National Documentation Centre and what kind of consulting would they value? In the first part of the event EKT will present innovation and networking services through "Enterprise Europe Network- Hellas" and "Knowledge Bridges". In the second part EKT will host in an interactive panel six dynamic entrepreneurs (Robin Schuil- Vendora, Angelos Stavrakis- CEO, SafeSize, Alexandros Seimanidis- Founder- B2B Wave, Marianna Vakalopoulou- cofounder, LiateR, Alexandros Srongilos- President & CEO στην Pro- Actina, Alexandros Sarasitis- CEO, Trygons), with whom it has collaborated via its services, presenting real examples of international innovative enterprises. The discussion will be held in English. Greek-Dutch business co-operation, including Greek entrepreneurs in Holland as well as young Dutch entrepreneurs active in Greece will be discussed, among other topics. The 2nd Hellenic Innovation Forum is being held under the auspices of the National Documentation Centre present with representatives throughout the two-day conference giving information on its actions and services, helping to promote networking and innovation. The event is been organised for the second consecutive year by Ethos Events in co-operation with the economic and business portal banks.com.gr and the HRHMA magazine. This year the country of honour is the Netherlands. Participation in the event is free but prior registration is required. If you register for the EKT event, you may attend both days of the Hellenic Innovation Forum 2018, free of charge. A few words about the 2nd Hellenic Innovation Forum: Promoting innovation is the way forward for economic growth and in recent years a great number of enterprises – both new and old- have used technologies of every kind and created new business models which have resulted in them operating successfully in Greece and abroad. Highlighting and enhancing these efforts will be the focus of the 2nd Hellenic Innovation Forum to be held on 19th and 20th June at the Divani Caravel Hotel. Enterprise Europe Network-Hellas: The National Documentation Centre (EKT), as co-ordinator for Enterprise Europe Network-Hellas, the largest Greek business support network, supports innovative and outward-oriented Greek businesses to gain access to new markets and funding. It provides customized services for innovation management and scaling up businesses. It gives information on European policies and enables SMEs to participate in consultations on future initiatives. The Greek network mediates approximately 100 transnational partnerships per year. EIT Health: EKT is the EIT HEALTH HUB GR coordinator and us such provides support to Health, eHealth, Medtech, Biothech, DigitalHealth and other health related SMEs, Startups and Scaleups mostly utilizing the concept of the KTI (Knowledge Triangle Integration). EKT Presented the opportunities for the abovementioned startups and Scaleups to apply to various competitions like the EIT Health Catapult and Headstart competitions , the Innostars awards and other Campuses and trainings for Postgraduate health sector students to increase their entrepreneurial skills, like the Smart up Lab. EKT also had a stand presenting amongst other services the EIT Health HUB services and engaging citizens with the help of supported startups. The initiative 'Knowledge and Partnership Bridges': is implemented by the National Documentation Centre following a plan designed by the General Secretariat for Strategy & Private Investment, Ministry of Economy & Development to address the issue of the outflow of Greeks abroad. A means of achieving this is to highlight the advantages that can derive from the networking of Greeks around the world is a means resulting in the shaping of the country’s future in a tangible way through mutual support on a scientific, professional and business level.